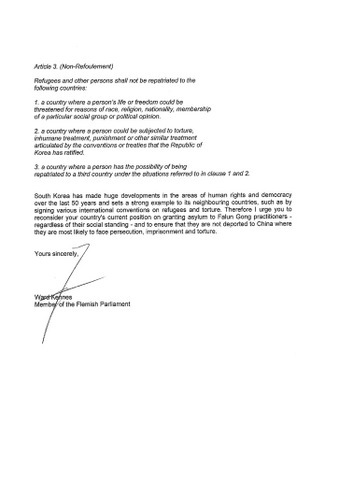 Mr. Ward Kennes, Flemish MP and the Mayor of Kasterlee, a community in Belgium, sent a letter to the President of South Korea in support of persecuted Chinese Falun Gong practitioners seeking asylum in South Korea. 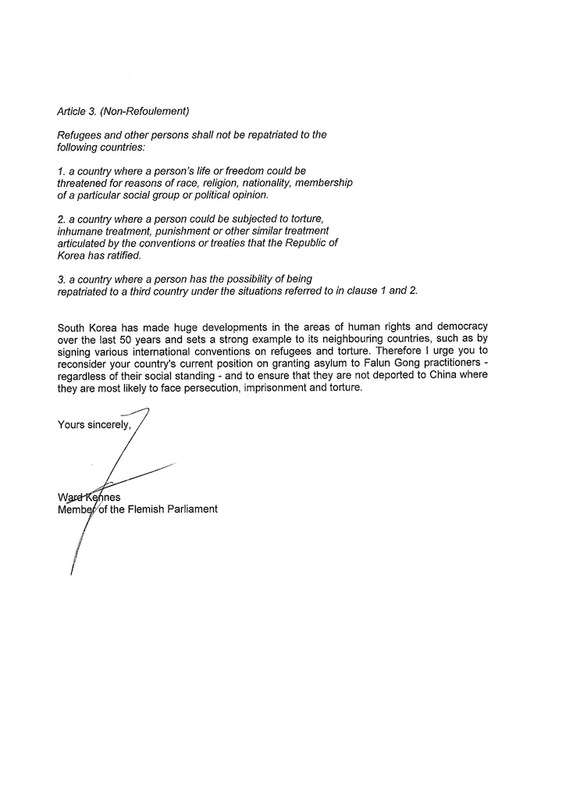 A copy of the letter will also be sent to Ambassador Ho-Young AHN of the South Korean embassy in Belgium (Korean mission to the EU). Mayor Kennes also promised to inform the foreign relations advisor in the cabinet of the Flemish Minister-President of the situation. 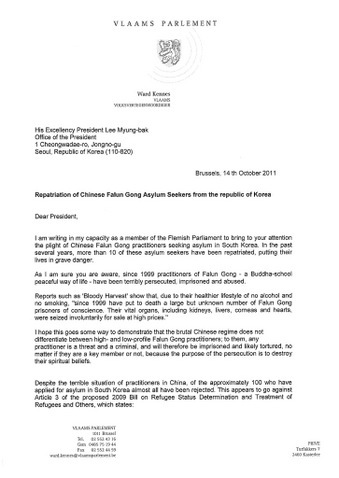 Earlier in 2010, in response to a letter concerning the persecution of Falun Gong, Mr. Kennes replied, "In the past, as a Flemish member of Parliament, I welcomed Falun Gong practitioners to the Flemish Parliament, to learn more about the persecution by the Chinese communist regime." "I completely reject this repression. It is unacceptable for a civilized country. The three principles of Falun Gong, Truthfulness-Compassion-Forbearance, can count on my appreciation and respect." 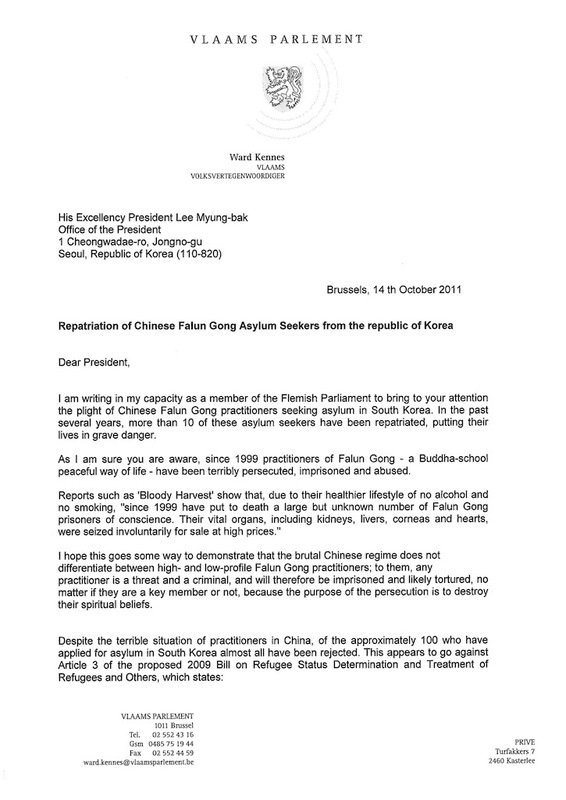 Mayor Kennes also stated that people should not hesitate to contact him in the future if he could be of any service to Falun Gong or other groups persecuted by the Chinese regime.